The month of April is a celebratory month in our house as there are so many Indian festivals to celebrate along with dear husband's birthday. My husband loves paneer recipes - Tandoori Paneer Tikka, Shahi Paneer, Palak Paneer and Matar Paratha and in dessert, he can't get enough of this Shahi Mango Paneer Kheer to name a few. So I wanted to add a little magic to his birthday celebration feast with an extremely delicious Paneer dish which I can serve for a starter. Usually, for an Indian starter, we love barbecued and smoky flavoured dishes rather than deep fried oily items. Tandoori Paneer Tikka, is a universally loved vegetarian Indian starter, that we all keep coming back to. Sometimes though, it's nice to mix it up - changing the flavours and textures in a dish isn't going to harm anyone. It was a perfect time to prepare Creamy Panner Tikka as it coincides with an unopened Stellar Cast Grill Pan sitting in my kitchen. A perfect opportunity to put it to the test. A couple of weeks ago this very useful pan arrived from Stellar. It's always an exciting time for me to unpack a kitchen product - if someone else in the house hasn't eagerly opened it first! .For me, the grilled pan is an essential item as much as my other pots and pans. I use my grill pan quite heavily, so I need a well-made pan that stands the test of time - it doesn't hurt if it looks the part too. These are just some of the pointers on my tick list that I had for the Stellar Non-stick Grill Pan. 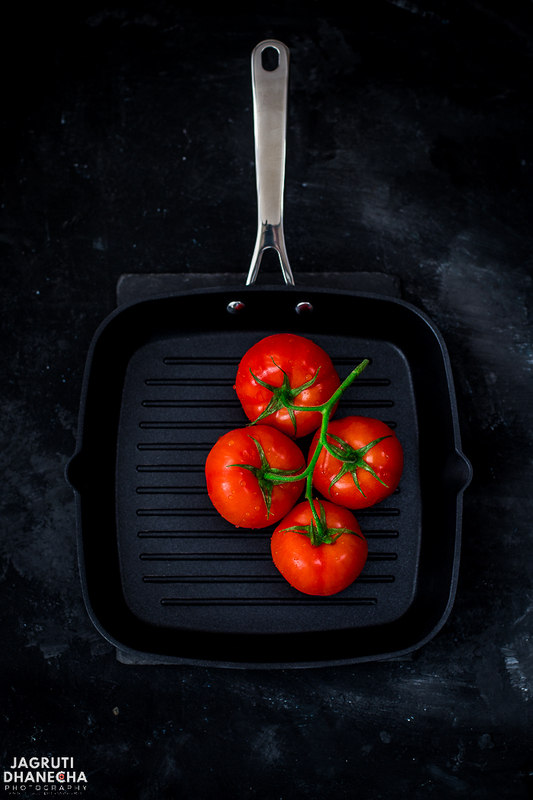 What is a Grill Pan and what are the benefits of it? Grilled Pan or Grill Pan is a pan that has raised edges with grill lines, and there are many benefits to own one. When the weather is not great - dull, cold and rainy outside (Brits will understand) and can't access your outdoor grill, this grilled pan becomes very handy and you can enjoy all those delicious chargrilled food indoor without the sunshine. You can grill or chargrill, and give a smoky flavour to meat, fish and vegetables. On food, little black chargrilled marks look so satisfying. All the juice and fat that you can collect because of the raised ridges, food cooked this way contains less fat. Thinking of buying a Stellar Cast Non-Stick Grill Pan SX35 (RRP £50.00)? Then read this review. If this review makes you want to own a Stellar Grill pan all for yourself, then find a very generous discount code below - only for JCO readers! I was so happy with the look of the pan when I unboxed the item. The look of this pan is visually appealing, compared to another grill pan I had in the past. It would make for a good-looking gift to a food enthusiast! The pan comes in a casing that covers all the details and information needed on getting started with your pan. I was happy to note that it is also induction hob friendly. This is a good family sized pan 26 x 26cm, with the cooking area of 19 x 19cm. A big plus point with this pan is that it is much lighter than traditional cast iron pans, perfect for anyone who finds handling these heavy pans a problem! (My daughter can't now make that excuse). This pan is square, and it's stainless steel riveted handle looks rather impressive and fully sealed with high quality non-stick such as Xylan Plus that is from Whitford's long-life non-stick. This helps in easy food release and clean up. The pan is suitable for all hob types including induction, though NOT SUITABLE for overhead oven grill or microwave use. Heat will transfer from the base up through the ridges, as it is cast from 'high-flow' aluminium. Sharp edges ridges sear into the food and add that beautiful colour and delicious chargrilled flavours - exactly how it's done on the bbq grill. Easy draining with scalloped pouring lips, no more messy surfaces! Very easy to clean and dishwasher safe. 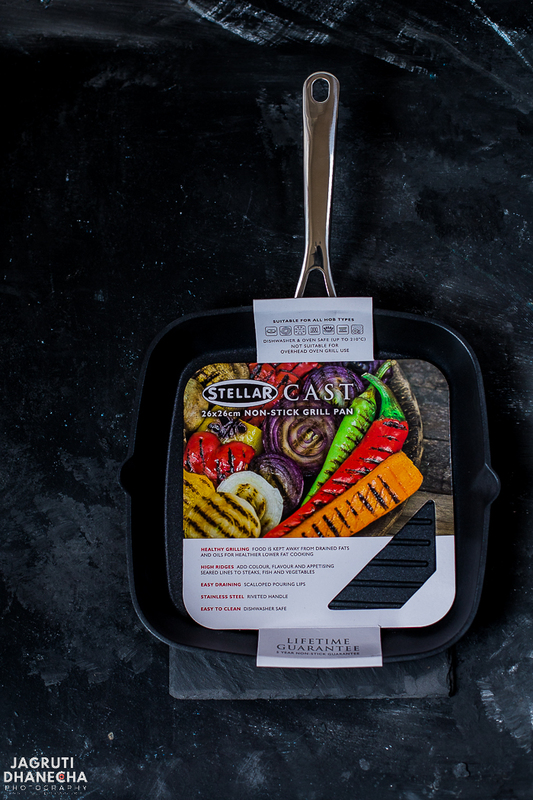 Stellar pan comes with the lifetime guarantee, with a 5-year non-stick guarantee. Having just got rid of my old griddle pan, I can confirm that my new Stellar Non-stick pan is so much better. The non-stick finish means my food isn't sticking to the pan and I am saving time on cleaning up! We tested this pan over the past few days and made several recipes. We grilled vegetables and bread to make open sandwiches and creamy paneer tikka and we are very happy with the results - everything cooked perfectly. We actually collected the fat from the paneer, had beautifully charred marks on the food and there was a lovely chargrilled flavour too. The pan performed well for us. This pan does whatever says on the tin (pan)! Let's put this recipe in one family. If I say creamy paneer tikka is a cousin of tandoori paneer tikka, I may get away with that. Both the dishes are made with using one common ingredient and method, which is paneer and grilling. Only the differences are in the colour, ingredients and flavours. Tandoori paneer tikka is prepared in tandoori marinate (almost fiery red colour) which contains red chilli powder, ginger garlic paste, yogurt. Tandoori paneer tikka is slightly tangier and spicier. Whereas creamy paneer tikka marinated in a much milder and richer marinate (creamy pale yellow sauce) which contains more exotic spices, yogurt and cream. It's rich in taste but not overpowering and definitely palatable for all. Now you know more about Creamy Paneer Tikka, let's see what you'll need to prepare and how to make creamy paneer tikka at home. For these soft, creamy and juicy creamy paneer tikka, you'll need following ingredients, a couple of them are optional and a few you can alternate if it's not available in your area. Most of the ingredients for this recipe should be locally available. Paneer - For this recipe, ONLY use firm and hard paneer, which you can cut into small chunks. Nowadays Paneer ( Indian cottage cheese ) is easily available in most of the supermarkets, or go to your nearest Indian grocery store. 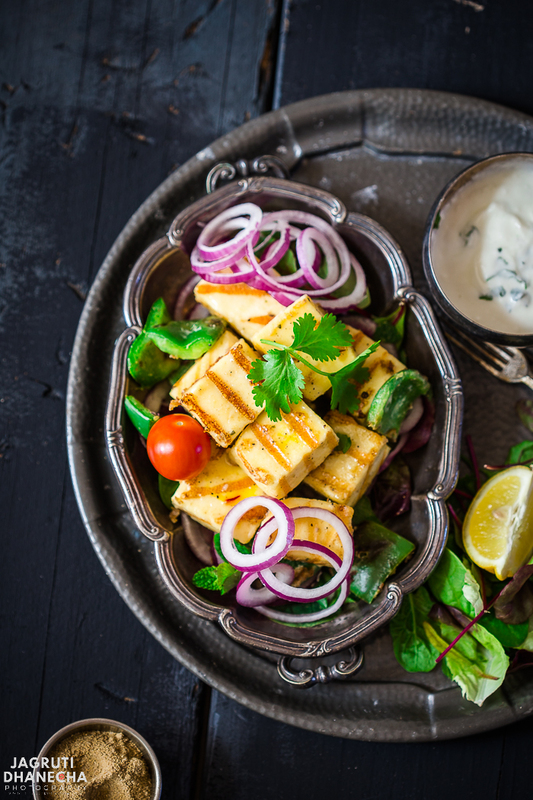 If you can't get hold of it don't despair as paneer is so easy to make at home with only 2 ingredients. Here is my foolproof Homemade Paneer recipe. Exotic Spices - Along with world's most expensive spice Saffron, you'll require cardamom powder and Shahi Jeera (caraway seeds). Basic Spices - Cracked Fennel seeds, Coriander seeds and black pepper. You'll also need white pepper powder, amchur powder ( dry mango powder), Chaat Masala (optional) and lemon juice. Vegetables - Fresh green capsicum or bell peppers, ginger and garlic. Othe ingredients - Besan ( fine chickpea flour ) and Kasoori methi ( optional ). Fat - Oil or Butter. HOW TO MAKE CREAMY PANEER TIKKA? First, prepare marinade by combining yogurt, cream, gram flour and spices. Do not add any extra water to make marinate thinner. Cut paneer and capsicum into cubes. Add into the prepared marinade. Cover the bowl with clingfilm and leave it at least for half an hour, allow to marinate the paneer, the longer the better. Once ready to make, thread paneer and capsicum in a skewer. Grill on a grilled pan. HOW TO SERVE CREAMY PANEER TIKKA? Creamy Paneer Tikka can be served as a starter, entree or appetizer. Once tikkas are off the pan/grill carefully remove from the skewer and serve it on a serving plate, sprinkle some chaat masala or lemon juice to bring out the levitate the best flavours and taste. 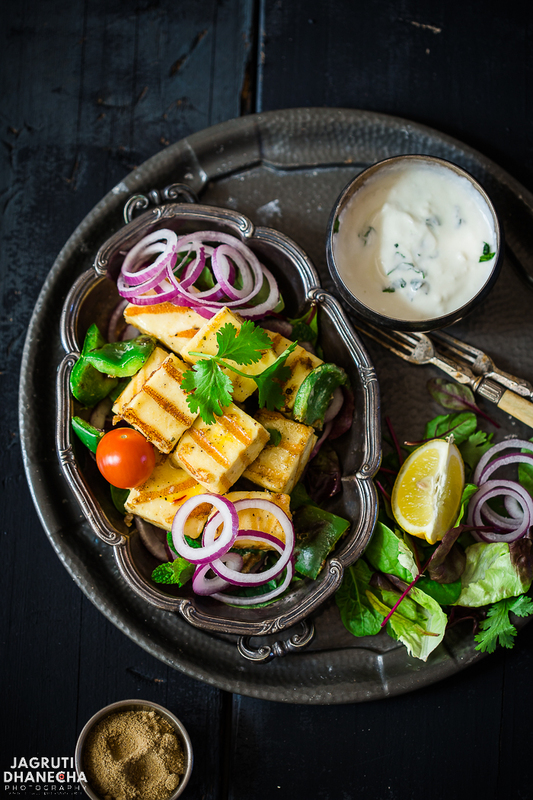 Serve piping hot tikka with mint and yogurt dip or green spicy chutney, along with thinly sliced fresh and crispy ( keep the onion slices in icy water for half an hour) red onion, lemon wedges and fresh salad. Make these easy, straight forward and drool-worthy creamy paneer tikka on a small get-together, your next bbq party or father's day and impress your friends and family. I bet there will be none left for you to try. HAVE YOU MADE OUR CREAMY PANEER TIKKA? Excellent! Glad you liked our creamy paneer tikka recipe, I hope you have taken a quick pics of it. Now share a pics on our social media Facebook, Instagram or Pinterest using a hashtag #jcookingodyssey. We are thrilled to see a recreation of this lip-smacking paneer starter. Learn to make Creamy Paneer Tikka, it is rich, creamy and flavourful Indian starter, entree or appetizer or meal in itself! Cut paneer and capsicum into cubes and leave it aside. First grind fennel, coriander, shahi jeera and black pepper seeds in a grinder to make a coarse powder. In a big bowl add yogurt, cream, salt, saffron, cardamom powder, amchoor powder, white pepper powder and four freshly ground coarse powders. Add kasoori methi and besan. Mix well and prepare a sauce. Add paneer and capsicum, mix well and make sure all the cubes are coated with the marinade. Cover tightly with the cling film and leave it aside in cool room or refrigerator for at least half an hour. Longer the better. 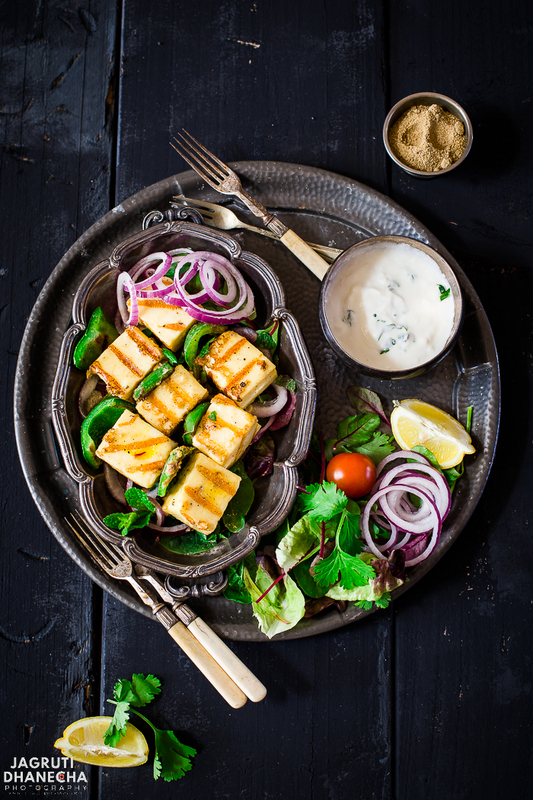 Thread paneer and capsicum alternating onto the soaked wooden or metal skewers. Remove the excess marinade from the tikka. Heat the grill pan on medium heat and let the heat distribute evenly everywhere. Lightly brush the pan with the oil or melted butter. Remove carefully tikka from the skewer and arrange on a serving platter. Sprinkle chaat masala or lemon juice and serve with thinly sliced onion, lemon wedges, salad and chilled soft drink or beer. To prepare a hung yogurt, place yogurt in a muslin cloth and tie a knot and hang it just above your kitchen sink, I usually tie it up to tap, for half an hour. Still interested? I bet you are! Then visit https://www.horwood.co.uk/brands/stellar and use this discount code - JCOSX35 It will take 50% and free delivery off the Stellar Grill Pan SX35. 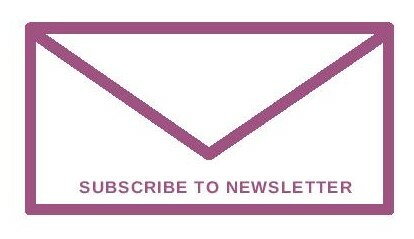 Please note, one per customer and the promotion lasts until the 31st of May. Disclaimer- I was sent the Stellar Grill Pan SX35 by Horwood for an unbiased review and not told or paid to write anything positive. All thoughts and opinions are my own. Thank you, Stellar team. Thank you for such detailed instructions! I've never tried cooking with paneer at all but it sounds delicious! 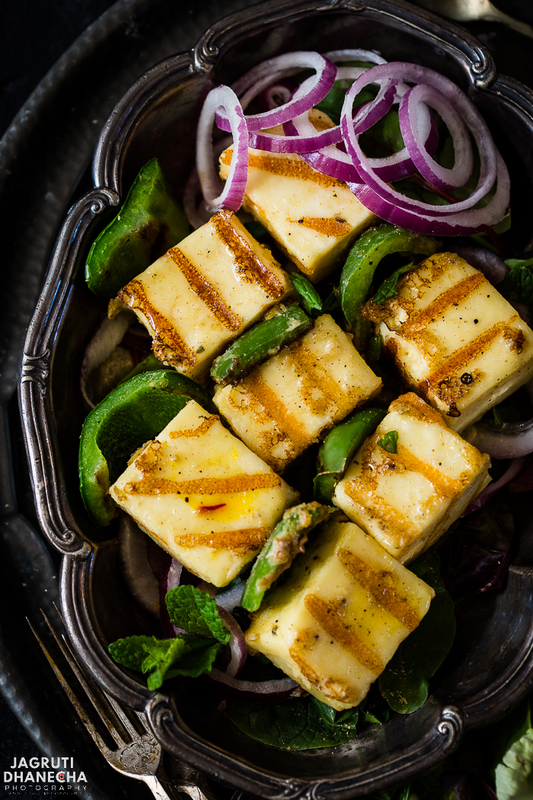 Feeling inspired to try a paneer dish! Lovely sounding dish. I love Indian food, but I have not tried this. What a great party starter. With the instructions, I know I can make this...and devour it. 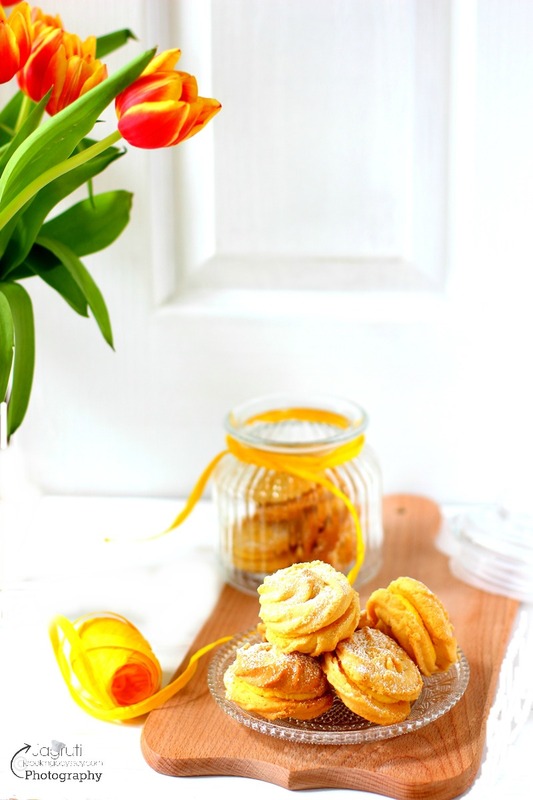 i am dying to make this - it sounds so delicious! I even have all those ingredients in my pantry right now #weekgoals LOL! I am always interested in new kitchen gadgets. Your recipe looks so good. I will make this recipe using tofu. Been watching Bollywood movies and some of them featured foods of India. This recipe looks delicious and healthy. Can't wait to give it a try. 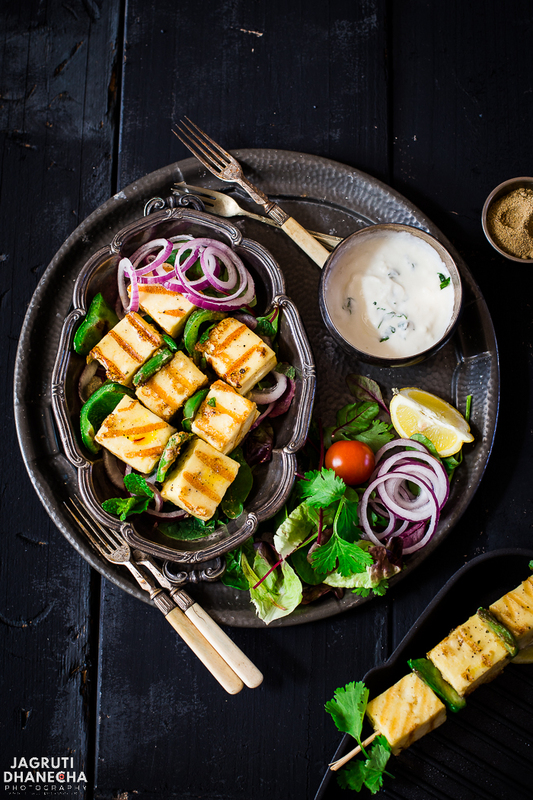 I love paneer, and those beautiful grill marks look incredible I would love to give this recipe a try. Homemade Indian food is incredible. I love making new and exotic dishes for my family. This definitely sounds like something that we will all like. It has so many different flavors. Looks delicious and so tasty. I saved the recipe to give it a try. WOW< I love that this goes with just about anything for a smoky flavor to meat, fish and vegetables (maybe even tofu)! I really like paneer, but have never tried marinating it. Must give a try! Oh wow, this dish looks divine! I have never had paneer before, but I want to try this out. I've found myself loving so many different types of more exotic dishes lately, and this one may be next on my list! I need a new grill pan. This one looks great! This paneer tikka is also so delicious looking! Can't wait to try it!